The good thing is that Make It Perfect WILL be at AQM, thanks to my fantastic distributors, Creative Abundance (THANKYOU Nel, Jacques and co!!) but I won't be. I'm sad that I don't get to go and hang out with the other designers and chat with some of my wonderful customers, but will be there for sure next year! SO...to celebrate AQM and thank you all for your support and encouragement over the last 18 months, I am going to have a MEGA-GIVEAWAY on the blog! There will be THREE prizes and lots of different ways to enter and get extra entries, make sure you read the "fine print" at the end of the post to make sure you have the best chance of winning. 3. A set of FOUR Make It Perfect patterns: Uptown Girl, Pinny #2, Pinny and Dinohunt Quilt. 1. A set of THREE Make It Perfect patterns: Pinny #2, Pinny and Dinohunt Quilt. 3. 5 "scraps" of fabric from my stash - these are decent sized scraps, fat quarter size and bigger. 1. A Make It Perfect Dinohunt Quilt pattern. 2. 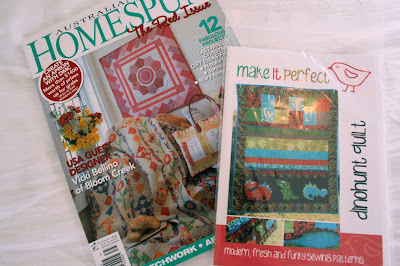 The current edition of Homespun magazine. So, there you have it...FOUR easy ways to enter the Mega-Giveaway. The winners will be drawn on Thursday 19th November, so you have heaps of time to take photos of your Make It Perfect creations and send them to me!! I love your patterns...I have not been able to buy one yet so I haven't made anything. I have never made a quilt, kind of intimidating for me, but someday! Sorry you had to miss the AQM! Thanks for having such a great giveaway. oh! your patterns look so lovely. I'm yet to make any of them (newbie sewer here), but once I get a bit more practice I have plenty of them on my list of "need to do"!! but not sure it's in my best interests to tell more people about it?! This is such a great giveaway! I would love to try out more of your patterns. I just finished the Uptown Girl jacket. You can find ithttp://sweeterthancupcakes.blogspot.com/2009/11/cupcake-coat.html on my blog. I won't be greedy as I have so much of your goodness, but I will blog about your giveaway. It's fantastic Toni! I would LOVE to sew one of your patterns....they look so gorgeous! Hello Toni, Please enter me in your mega-giveaway. What wonderful prizes you are offering. Ohh, I am always hopeful I might win one of your patterns!! Good luck with the AQM!! congratulations on AQM. that is awesome! you have great patterns! Love your stuff! Please enter me! I'd love to enter! I've been wanting to make that skirt and bought the pattern not too long ago, but with everything happening I haven't had a chance to make one yet. Shoot it would have given me another entry. Any way, good luck everyone! Thanks for the chance. mmm, i'm loving prize number 1! i'd love to get my mitts on one of your patterns! I think this is a great giveaway and I hope I'm fighting Lisa for the skirt! And another entry for publicising the big giveaway on my blog! What an AWESOME giveaway! Thanks for the chance to win!!! *WOW* Toni, what an absolutely AMAZING giveaway!!! So many ENCHANTING prizes to win! I am utterly smitten with the Blossom set you have created with the eye-catching Sandi Henderson Ginger Blossom! Now Jaida would be one lucky little girl to have such vibrant material added to her rural country wardrobe this summer! Namaste' Toni, your generosity deserves great karma from our Universe! Pinny - we have another set in motion with Amy Butler Fabrics too (will blog when finished) This one uses the Max New, Spring Carnival Range. 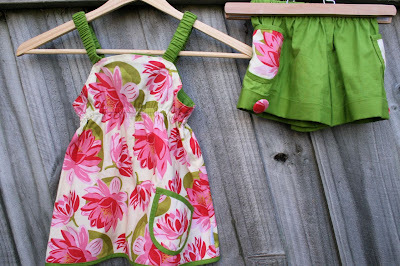 Your patterns launched my love of sewing little girly clothes! What a great giveawy! I want that skirt. Really, really want it! OMG what and AWESOME giveaway!! Perfect for pre-christmas when we are all so busy thinking about gifting to others. i would love to make something from your pattern's for eden. i made a skirt when i was sixteen as i told my dad i wanted to be a fashion disigner, so he went and brought me s sewning machine.... that's one entry done..
Wow Toni what a great giveaway. I have yet to make anything of your patterns but I have the uptown girl sitting here waiting till I get up the courage to try it. Very much a novice sewer here. OMG what a fabulous giveaway!! It's exciting just to enter lol, but it would be even more exciting to win!! Hi Toni, I really love your blog and your patterns are just gorgeous. They all look so wonderful, I'm not sure which I'll try making first... Thanks for the opportunity to win one! It is very generous of you. What an amazing girl you are! I found out about you through my friend Holly Atkinson and have been intrigue ever since. I love sewing and would love to see my little girls in your uptown pattern. What an amazing girl you are. I found out about you through my friend Holly's blog and have been intrigued ever since. I love sewing and would love to sew uptown girl for my little girl. How exciting, I just love your patterns! Please put my name in the hat :) A couple of friends are pattern testers and they rave about them! I'd love the skirt - versatile suits me to a T! Wow what a massive giveaway! You are very generous! Wow what an awesome giveaway!! The wrap skirt I made, a friend saw it and loved it so much shes begged me to sew her two! Good thing I love her lots, and the pattern is a great sew! wow what a generous giveaway! I too would love to be able to go to the AQM but alas I'm at home instead! Please enter me I would love to make more cute things for Chloe! This is VERY exciting great work Toni- I am sorry you had to miss AQM though! I love your patterns and making the clothes..I was just thinking I have made quite a lot of things now...the versatile wrap, little girly reversible skirt and 2 hats and the boys shorts....love them. Thanks for having this giveaway. What a generous giveaway! I would love to try one of your patterns! Who wouldn't want to be a part of your MEGA GIVEAWAY! 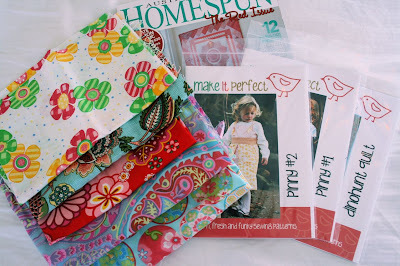 Can't wait to hear about your latest feature in Homespun! Congrats Toni! Count me in please! I'd love to have a go at some of the patterns & the skirt looks great. Wow Toni another great competition although this is a much bigger one. May have to take a photo of my wrap around skirt! What an awesome giveaway! I'd take the patterns if I was lucky enough to win. I have the skirt pattern and have used it a few times. What a wonderful giveaway - great patterns too!! Love it! :-) Thankyou! Wow. Gorgeous prizes up for grabs! Wow what a great giveaway, very generous!! Sorry to hear you can't make it personally to the AQM, however next year will feel more special than the last. I would love to win ant of your items. I have bookmarked a few of your patterns for my to do lists-hopefully next year!! Ohhh this is the first time I've been to your blog but it's delightful! I am a huge fan of your designs! I love a good giveaway and this one is tops- count me in! Hi Toni, I've just left a link on my blog for another entry into your competition... thanks! Please enter me in the draw! Your patterns are gorgeous and it's such a generous prize. I am about to email you all the links from my completed projects too. Hi Toni. You are very talented indeed! Did you knit the pea pod pattern I sent you for Tommy? I love love the skirt. Are sewing lessons thrown in with the prizes? mega giveaway indeed! thanks for your generous prizes, I would love to be a winner...I usually only quilt, but have been meaning to try some clothes for my kids. thanks for the chance! Please enter me, i'd love to try your patterns, have heard heaps about them. thanks! Be still my beating heart....what a delicious and gorgeous giveaway!!!! I have made lots of your treasure bags for each of my children and friends children and nieces and nephews....they are awesome and I am the proud owner of 5 wrap skirts...they keep breeding ( LOL) !! Thanks for inspiring us !!! Lovely giveaway, "mega" dscribes it perfectly! what a super mega giveaway! Count me in Tone - anything to stop Lisa from winning! That's MEGA cool from you, to give these great things away. Thanks for counting me in. Oh... I would love some more patterns. What a wonderful give away! How lovely of you to be so generous when you are so sad. I guess that while you are sad to miss the show, your family needing you is way more important. Thanks for having such a great giveaway. WOW! You are so, so generous! Thanks for the opportunity - my sewing machine is on the bench like an ornament gathering dust! Just blogged about your lovely giveaway. Oh wow. I am so loving the wrap skirt. You are too generous. Good luck to everyone! I love your patterns! Will send a link to my blog pictures as well. Wow - what a giveaway! If only I'd ever created anything from one of your patterns - I have been having pattern envy for a while so would relish the opportunity to win one to try out! Wow - this lot looks fab. Pick me, pick me! wow - what a giveaway! Count me in! Please include me in the draw - that Bloom set is divine. Fantastic giveawya - thank you. So sorry you'll miss the show this year; however, family, new house, etc is very exciting anyway. Thanks for the opportunity to enter your mega giveaway ... it's very generous. Have mentioned on my blog for all to have a look! Will blog about this one too so stop by? Wow - this is so generous - I love your patterns and would (like everyone else here ) Love to win! I have listed this giveaway on my blog here (http://cherri-berri.blogspot.com/2009/11/make-it-perfect-giveaway.html) and also listed links to the three Uptown Girl jackets I made in there. WOWEEE!! Who wouldn't want to win such a gorgeous giveaway! Thankyou for your generosity. I have only had a chance to make one of your patterns & it was fabulous & went together so easily. I will try & email the picture! Would love to win any of them. That skirt is super cute!!! I would love to win the set for a little girl, just perfect in the Sandi Henderson fabric! ps. cant wait to order the new pattern! Just love to win the Bloom set with the Sandi fabric! ps. cant wait to get the new pattern in hands! Oooh what great prizes! Off to take photos of my Versatile Wrap collection to send in for extra entries! Love your blog. 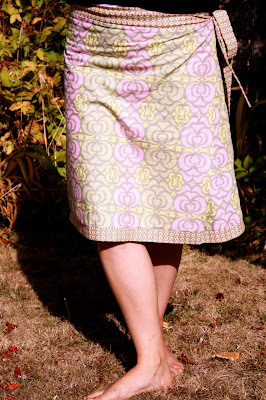 Here is my blog entry from long ago with the picture of my wrap skirt. I really like your patterns!!! I already own your Uptown Girl pattern, and even have the fabric ready and waiting! All I need now is some fusible pellon and I'm set! I would absolutely love to win some of your other patterns too. I'd love to be counted in for an entry - I absolutely love your patterns!! I would love some patterns! I've just started to sew clothes for my little girl and would love to add one of yours to my growing collection. Hope you get to go to the AQM next year! Hope I'm not too late, used your pattern last week and drew my own blogging giveaway from it. The hat was a success, and the pattern so easy to follow. Congrats on your success!